Radio power is on a yellow/black wire, paired with a blue/red wire (lamp power) on a 2 pin female plug. If you need battery power for radio memory, I suggest splicing into the cigarette lighter wire (blue/white). Now then, if you take this advice, you are not permitted to listen to opera, country/western, or rap, you hear me? Does anyone have any pictures on how the windlace is supposed to run behind the cap and where the single screw for the cap itself mounts to? I am also about to install the quarter trim windlace and was hoping to find a good picture of how this should terminate at the top. I do not have the originals to go by and it looks like I need to trim the grooved portion at about a 45% angle to slide farther up the channel. Thanks in advance for any help. I am putting in a nice 1980’s radio in a 69 mustang. I want to plug it into my factory harness for power. What plug would I use for the switched power (red) wire on the radio? I took the old radio out in the fall and did not mark where it was plugged into. 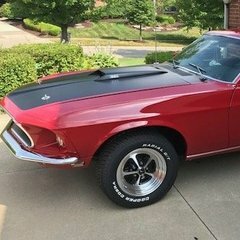 The ones on a 68 are the same, have a 69 vert project with no power top. Correct me if I'm wrong, but I didn't think they reclined. My air cleaner didnt fit... offset base showed up today. I had a 1" drop on my original base, but there is no drop on the new base. Not sure if that will make a problem for me or not. Also ordered a Quik Latch for the air cleaner lid. That should help with hood clearance vs. traditional stud/wing nut combo. Ya, no kidding. Just read the AOD swap thread, from a guy who lives here in Bako! There's a bunch of info in there that I unfortunately had to learn myself. With all the google searching I did on AOD swaps, not once did the thread here in the How To forum show up. And again, I'm a day late and a dollar short. Thanks those are great pictures. I'll compare to my original. No idea if its original or not. Came with the engine. The one I purchased is lighter gage than the original and does have the spot welded drain plug. I'll check mine to your dimensions. You should stop by more often Bob, there's some good stuff over here. Thank you Terry! I don't think I've ever looked at this How To forum. I added a post over in the "How Tos" section that tells how to make a magnetic kill switch. Its titled "The Ultimate Kill Switch ?" I detailed how to make a magnetic kill switch over in the "How Tos" section. Its titled "The Ultimate Kill Switch ?". It's been common knowledge that TMI seats are to tall, that's their biggest complaint. Another problem with high bolster seats is getting in and out, not mention if you happen to be big. Check out our seats in Craig's build. I designed them off the 94 - 98 Mustang, and they sit no higher than the factory. Finished the brake system rebuild today! I put a write-up with pics here: The post-finish test-drive was the best part.. Noticeably Improved braking and the system doesn't look like hell anymore. Welp, Hate to admit it but I didn't take the advice to paint instead - I did use the 2 part clear epoxy over bare metal, and I am pretty happy I did (at least for now). Results attached below, but these parts came out great. I also put the clear on the new master cylinder, as well as it's gold cap, and I polished up the brass dist block and covered it too to keep the bright finish. All the parts look fantastic - a wire brush will remove it all if I find some reason it's not working out. To follow up on a few things. I was able to de-rust and wirebrush the original MC push rod. Mine is all original, and the replacements don't come in two pieces anymore. The new seal that came was night and tight, so any pitting is not an issue. Using "osphor" to de-rust, then following up with a wire brush wheel did a great job on both the booster and the push rod. The guys at brake booster exchange were a lot of help with advice. The seal kit from NPD combined with the glass-smooth finish on the booster make a perfect seal around the push rod and against the booster and at the vacuum inlet line. On the test drive today, I have noticeably better braking action, I suspect because of the improved booster seal. Could also be due to new MC. Also, my brake lines and tube nuts looked like hell (rusted and paint coming off) so I replaced several of the lines with the new corrosion-proof Cu-Ni-Fe tubes. I bought stainless tube nuts on amazon and they are fantastic. If you are ever replacing brake lines, I would never put in anything but the Cu-Ni-Fe stuff (85% copper and 13%Ni, rest Iron & other stuff). It is just wonderful for flaring, sealing against the anti-flares, and is corrosion proof. It's exactly the right material for this job. It tests out at almost 9000 psi, so plenty for braking. Anyway, pics attached. Below is what it looked like before I started (Man - am I embarrassed this was on my car!) And that's a WRAP FOLKS! Happy Easter btw guys!